Raw coffee is a light yellow to light blue-green hue, depending upon processing and growing region. It smells like hay or split peas. Roasting changes not only coffee’s color and smell but also its size. During roasting coffee beans change from green, to yellow, to brown. Between yellow and brown the beans pop like popcorn (“first crack”) and double in size. From this point on the coffee becomes palatable. If you go beyond a light roast coffee will begin to pop again (“second crack”) this is the point when the “roast” flavor will begin to develop and can, if let go long enough or not cooled fast enough, take over the flavor of the bean. At “second crack” the woody structure of the bean begins to break down and burn. The oils within the bean surface quickly. Coffee flavor has two sources (if you don’t count the water! ), the flavor of the bean and the flavor of the roast. The taste difference between different origin coffees is most apparent at a light or medium roast. At darker roasts the flavor of the roast begins to dominate, acidity is lost, body increases and flavor is generally stronger. Very dark roasts are even stronger and tend to have a caramel-like stickiness. Each of our coffees is roasted to a level which will achieve their origin character and a distinct roast flavor or blend. Harvest Café Coffee Company has a variety of roasted beans. If you find yourself wondering what the difference between “House” and “Espresso” beans is, it’s all in the roast. Light/Cinnamon Roast – This roast produces an acidic, highly caffeinated coffee. It will be quite bitter. Contrary to the name, it does not contain cinnamon — but the color is similar. You may not find this anywhere other than in North America. City Roast – The beans are chestnut brown with a noted richness from the oils, which are close to the surface. The coffee has a nice balance between acidity and body, affecting a mellow, well-rounded tasting cup. Harvest Café Coffee roasts a high percent of its products to this specification. This roast looks great and lends itself to a very consistent, well-balanced cup. Color: Medium Brown Acidity: Natural acidic qualities of the origin come through Body: Nicely developed Surface: Generally dry or very little oil on bean surface. Full City – The beans are darker with a light shine and possibly a few tiny drops of oil on the bean surface. Darker roasts have less caffeine, and are less bitter and have more body. You’ll notice that they’re often sweeter. Color: Rich full brown Acidity: Slightly diminished from medium roast. Body: Heavier, more pronounced. Surface: Oil droplets may appear depending upon origin and hardness of bean. All coffee, whether it is whole bean or ground, deteriorates after roasting. Coffee beans are highly perishable. This is especially true of ground coffee, since so much more surface area is exposed to flavor-robbing air, moisture and light. Since coffee is at its peak about three days after roasting, it is best to buy coffee fresh each week or month and grind just before you brew it. Our preference for grinding is a small burr type grinder. A small blade grinder will work, but will not give you a consistent size grind. You should never refrigerate your coffee, especially in a frost-free system as it will dry up all the oils and moisture that give coffee its wonderful flavor. Freshly roasted ground coffee will maintain most but not all of its flavor components for about two weeks when stored in a dark, room temperature, airtight container. Whole bean coffees, which have much less surface area than ground coffees, will store longer and maintain their flavor for about four weeks after roasting. Regardless of how you store your coffee, you will experience more taste and flavors in coffee that is a few days past roasting than coffee that is consumed weeks after roasting. Remember that air, moisture, and light are coffee’s worst enemies and a home grinder will help provide fresh coffee flavor in every pot. The more you experience coffee, the more educated your palate will become. As you taste and compare coffees, you will discover which taste characteristics appeal to you the most. Experiment with different origin or estate types and you will be on your way to discovering a world of possibilities. Coffees can be described using a wide variety of terms, but the most important taste characteristics are aroma, flavor, acidity and body. Aroma: This is what the nose senses as the cup is brought to the mouth to taste. How intense and pleasurable it is affects your impression of the coffee. Aroma provides a subtle introduction to various nuances of acidity and taste: bittersweet tones, fruit, floral, herbal notes, and the like. Flavor: Refers to the overall experience of drinking a particular coffee, which includes both taste and aroma. Specific flavor attributes can be found in certain coffees, such as fruit-like sweetness, chocolate taste, and hints of earth or spice, a nut-like aroma or wine-like taste. Acidity: Is another important, though often misunderstood, term. In coffee, acidity has a very desirable, refreshing, mouth-cleansing quality. Acidity is a bright, lively taste that makes coffee the ideal morning wake-up. At best it is tart, offering rich vibrancy that lifts the coffee and pleasurably stretches its range and dimensions. In most Kenya AA it can be overpoweringly bright and wine-like, while in many Sumatras it is low toned and almost hidden. The darker the coffee is roasted, the less overt acidity it will show. Body: Refers to the perceived oiliness and thickness of the brewed coffee on the tongue, that buttery or almost syrupy feel in the mouth. It is that sensation of weight that gives power and persistence to taste. Body can range from light to very heavy depending on coffee origin and choice of brewing method. Body tends to increase with darkness of roast until it peaks at about medium-dark roast, then begins to thin again as the coffee is roasted darker approaching an almost black as in our French Roast. Grinders There are essentially two categories of coffee grinders; burr grinders, and blade grinders. Blade Grinders use a spinning metal blade to grind coffee, as you probably guessed by the name “blade grinders.” These tend to be cylindrical plastic devices. These grinders have two major drawbacks. First of all, the coffee is not ground evenly, so you can’t get a perfect grind out of them. Secondly, the blade and motor tend to heat the coffee, which is detrimental to the flavor. For those reasons, this type of grinder isn’t recommended for espresso. Burr Grinders use a spinning metal plate to shred the coffee evenly. These machines are automatic — you tell it how much coffee you want and how fine you want the grind. This is the recommended grinder. Grind Categories There are a variety of grinds available, but they all fall into three major categories: Drip Grind: This grind can be anywhere from very coarse to somewhat fine. Drip coffee will be quite a bit stronger with a finer grind, but it should be less fine than espresso. If the grind is too fine, you’ll end up with some pretty “sandy” coffee. Espresso Grind: This is a very fine grind, but it shouldn’t be so fine that it goes through your filter! It should look like fine sand. The increased surface area unlocks much of the flavor of good coffee. Turkish Grind: This is an extremely fine grind. In fact, it’s so fine that it’s powder. Turkish coffee is made by mixing powdered coffee with boiling water. This process may look like the makings of instant coffee. Coffee should be stored in an airtight container. Protect your precious beans from their #1 enemy, air. Proper way to store coffee. You should never refrigerate your coffee, especially in a frost-free system as it will dry up all the oils and moisture that give coffee its wonderful flavor. Freshly roasted ground coffee will maintain most, but not all, of its flavor components for about two weeks when stored in a dark, room temperature, airtight container. 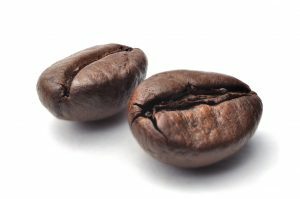 Whole bean coffees, which have much less surface area than ground coffees, will store longer and maintain their flavor for about four weeks after roasting. Keep your equipment clean. The build up of coffee oils and mineral deposits will ruin the taste of your coffee, as well as damage your equipment. Use quality beans that are fresh. Once roasted, coffee stales very quickly. The shelf life of fresh roasted coffee beans is 2 – 3 weeks. The key to a great cup of coffee is fresh premium beans. “FRESHNESS” AND “PREMIUM BEANS” IS WHAT HARVEST CAFÉ COFFEE COMPANY IS ALL ABOUT! Use fresh, cold water. Coffee lovers should keep in mind that brewed coffee is about 98% water. Filtered or bottled drinking water is great because odors and chlorine are removed. DO NOT use distilled or softened water. Grind your beans just before brewing. Coffee stales much faster when it is pre-ground. Match the grind to the brewing method. In general, the longer water will be in contact with ground coffee during the brewing process, the coarser the grind should be. Getting the right grind takes a little experimentation but is well worth the effort. If your coffee is coming out flat and boring, then try using a finer grind. If your coffee is coming out sharp and bitter, then try using a coarser grind. Grind evenly. 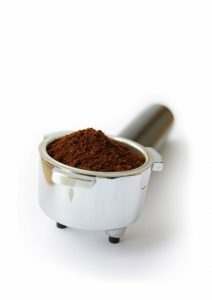 Uneven grinding causes some ground coffee particles to be too large and others too small. When this happens, the end result is a brew that is both over extracted and underdeveloped at the same time. Treat yourself to a good grinder. If you can’t find one locally, give us a call. Use about one level tablespoon of ground coffee per six ounces of water. This may seem like a lot, but if prepared properly most people will find this “brewing formula” will make an enjoyable, full flavored cup without being overpowering. Consider “oxygen bleached” filters. Oxygen bleached filters do not pose the environmental problems that chlorine bleached filters do, and they offer better cup quality than unbleached filters. 11. Keep the temperature of the brew water between 194 – 204 degrees F. This may be impossible to achieve with some automatic drip machines. If you boil your water, let it sit for half a minute or so, boiling water is too hot. Store brewed coffee in a thermal carafe. Your coffee will remain fresh and tasty for 45 – 60 minutes. Coffee left exposed to air and left on burners deteriorates rapidly. To keep your coffee warmer, “prime” the carafe by warming its insides with hot water ahead of time. You can also use this method to warm up cold ceramic mugs. Stir coffee before serving. This will even out the extraction for uniform flavor. Take the time to enjoy! Good coffee is really about treating ourselves. Allow yourself the time to appreciate your carefully prepared coffee. YOU DESERVE IT! The coffee bean is actually the seed or “pit” of an evergreen tropical bush, which grows to as high as 15 feet. The coffee “cherries” start as small white jasmine-like flowers and mature to a bright red “cherry” when ripe. Each coffee cherry contains 2 halves (or beans) and there are two major species of coffee that are grown for commercial use, Caffea Arabica and Caffea Robusta. Harvest Café Coffee Company roasts only highest quality Arabica beans. These are grown at a very high altitude, with careful attention to the soil quality, amount of shade and weather conditions. Arabica beans contain approximately 50% less caffeine than the inferior Robusta beans. In addition, Arabica yields far less coffee per bush than Robusta. Robusta typically has a dirty or rusty flavor to it. It is in wide use in Espresso Coffee Blends with some of the larger Commercial Roasters. Most coffee is processed using one of two methods, wet or dry. Washed or wet processing uses huge amounts of water and mechanically removes the outer shell from the inner parchment and beans. The beans are then fermented to loosen the beans from the surrounding parchment. The parchment is then milled to release the beans inside. The dry process is much simpler – the coffee cherries are spread out in the open sunlight to dry. After drying, the dry husks of the coffee are separated away, which leaves the parchment and beans. The parchment is then milled to release the 2 beans inside. If there is only one bean inside, then it is sometimes separated out and called Peaberry (due to its rounded shape). Specialty Coffee is so named due to the superior quality of the raw product, the careful attention to harvesting, sorting, processing and roasting. Only about 10% of the Arabica beans can be legitimately referred to as “Specialty.” Harvest Café Coffee Roasters seeks only the top 1 or 2 percent of these coffees, which are considered excellent representatives of their growing regions. Legend has it that coffee was first discovered sometime before the ninth century by a herd of goats in Ethiopia. A goat-herder named Kaldi awoke from his afternoon nap to find his goats dancing and bouncing off the rocks of the canyon walls. Kaldi followed his goats and found them munching on the red cherries of a bush. Being a curious type, he boiled the cherries in water and drank the potion himself. He became very lively and had no trouble staying awake during the evening prayer time. The wonderfully stimulating properties of coffee made it an almost instant hit and its use then became very routine. It is also legend that after Venetian traders brought coffee to Europe. Many priests accused the beverage of being a tool for the devil (anything this good MUST be bad!). However, the Pope, upon experiencing the pleasing aroma and taste of coffee, became so enamored with it that he thwarted the devil by Baptizing it. As you can see, coffee is truly a heavenly beverage.